As I mentioned in Redesigning bitsofcode, the graphic designer I worked with for the new bitsofcode logo created this animation to go with it. I knew I had to use it somewhere, so I decided to attempt recreating a section of it as a pure CSS animation. When creating a custom animation, the animation name is defined after the @keyframes keyword and the animation steps are defined within the block. The steps in an animation can be thought of as a timeline, from 0, marking the start of the animation, to 100, marking the end of the animation. Besides those two points on the timeline, we can have as many steps in between as we like. For example, let’s adapt the grow animation from above to a pulse. Instead of simply enlarging the element, we also return it back to its original size. We also don’t have to stick to one CSS style for each point on the timeline. We can apply as many styles as we want, like we apply styles to a selector. Once we have created the animation, we can then apply it to any element using the animation properties. 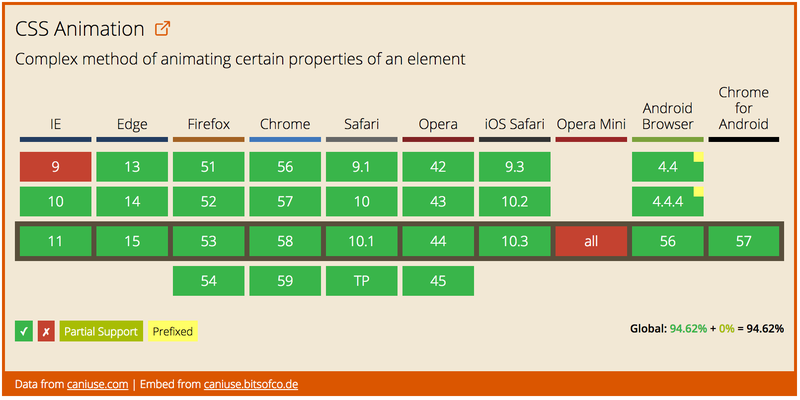 There are nine properties related to applying CSS animations. The logo, as you would imagine, is an SVG element. Each letter (or, in the case of the letter "o", half of a letter), is its own <path>. This allowed me to target each letter individually or target specific groups of letters together. A separate @keyframes rule was created for each of those sections, as the animation is slightly different for each of them. As I mentioned, each CSS animation has a timeline of events, from 0% to 100%. Since this was a bit more complex an animation than the pulse examples, I found it helpful to specifically write out the timeline before writing any CSS. Next, I had to takes these steps and map them onto a timeline, from 0 to 100%, where each step should be. This could then be translated into an actual CSS animation timeline. Once the timeline had been mapped out, I could then add the CSS styles for each step. For this animation, the only property I used was the transform property with translate() and rotate() functions. Finally, I wanted to apply the animation only when the anchor element surrounding the logo was in focus or hovered above. I wanted a cycle of the animation to take 3 seconds, and for it to repeat indefinitely. That’s it! I created a CodePen with the full animation if you want to take a look. See the Pen bitsofcode by Ire Aderinokun (@ire) on CodePen.